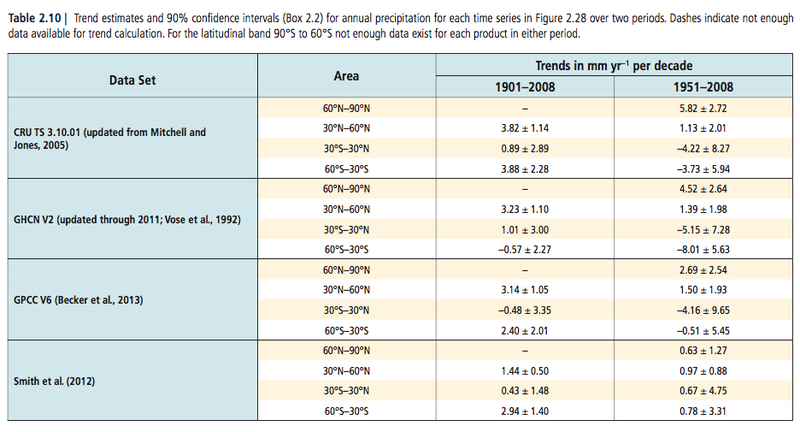 In XII – Rainfall 2 we saw the results of many models on rainfall as GHGs increase. They project wetter tropics, drier subtropics and wetter higher latitude regions. We also saw an expectation that rainfall will increase globally, with something like 2-3% per ºC of warming. Here is a (too small) graph from Allen & Ingram (2002) showing the model response of rainfall under temperature changes from GHG increases. The dashed line marked “C-C” is the famous (in climate physics) Clausius–Clapeyron relation which, at current temperatures, shows a 7% change in water vapor per ºC of warming. The red triangles are the precipitation changes from model simulations showing about half of that. The temperature has increased over the last 50 years, and models and observations show that the precipitation has.. oh, it’s not changed. What is going on? The distribution of moisture in the troposphere (the part of the atmosphere that is strongly coupled to the surface) is complex, but there is one clear and strong control: moisture condenses out of supersaturated air. This constraint broadly accounts for the humidity of tropospheric air parcels above the boundary layer, because almost all such parcels will have reached saturation at some point in their recent history. Physically, therefore, it has long seemed plausible that the distribution of relative humidity would remain roughly constant under climate change, in which case the Clausius-Clapeyron relation implies that specific humidity would increase roughly exponentially with temperature. This reasoning is strongest at higher latitudes where air is usually closer to saturation, and where relative humidity is indeed roughly constant through the substantial temperature changes of the seasonal cycle. For lower latitudes it has been argued that the real-world response might be different. But relative humidity seems to change little at low latitudes under a global warming scenario, even in models of very high vertical resolution, suggesting this may be a robust ’emergent constraint’ on which models have already converged. If tropospheric moisture loading is controlled by the constraints of (approximately) unchanged relative humidity and the Clausius-Clapeyron relation, should we expect a corresponding exponential increase in global precipitation and the overall intensity of the hydrological cycle as global temperatures rise? This is certainly not what is observed in models. To clarify, the point in the last sentence is that models do show an increase in precipitation, but not at the same rate as the expected increase in specific humidity (see note 1 for new readers). 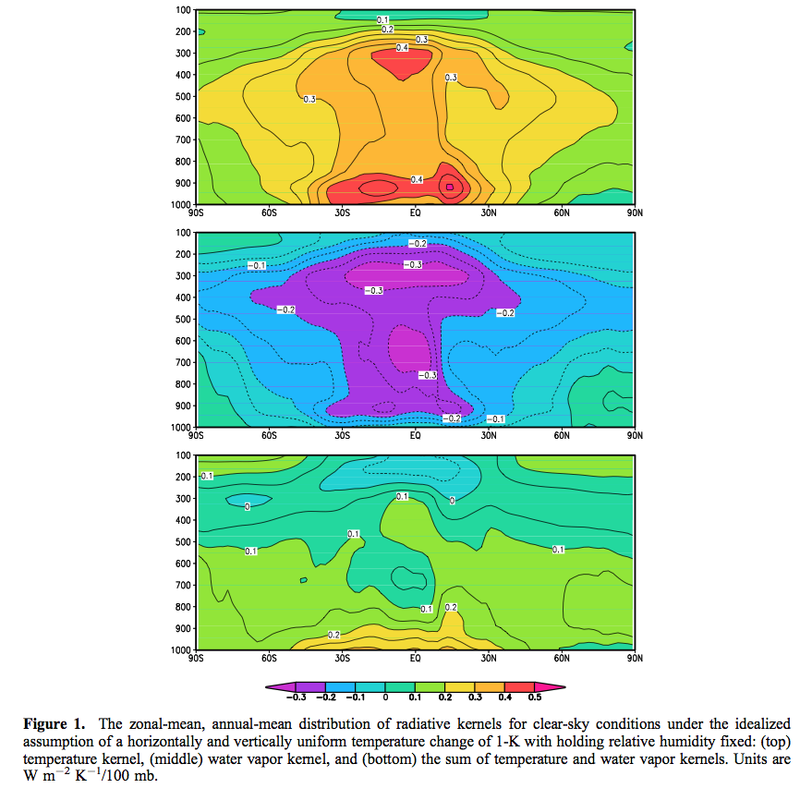 The explanation for these model results is that changes in the overall intensity of the hydrological cycle are controlled not by the availability of moisture, but by the availability of energy: specifically, the ability of the troposphere to radiate away latent heat released by precipitation. At the simplest level, the energy budgets of the surface and troposphere can be summed up as a net radiative heating of the surface (from solar radiation, partly offset by radiative cooling) and a net radiative cooling of the troposphere to the surface and to space (R) being balanced by an upward latent heat flux (LP, where L is the latent heat of evaporation and P is global-mean precipitation): evaporation cools the surface and precipitation heats the troposphere. In a warmer world, if we have more evaporation we have more latent heat transfer from the surface into the troposphere. But the atmosphere has to be able to radiate this heat away. If it can’t, then the atmosphere becomes warmer, and this reduces convection. So with a warmer surface we may have a plentiful potential supply of latent heat (via water vapor) but the atmosphere needs a mechanism to radiate away this heat. 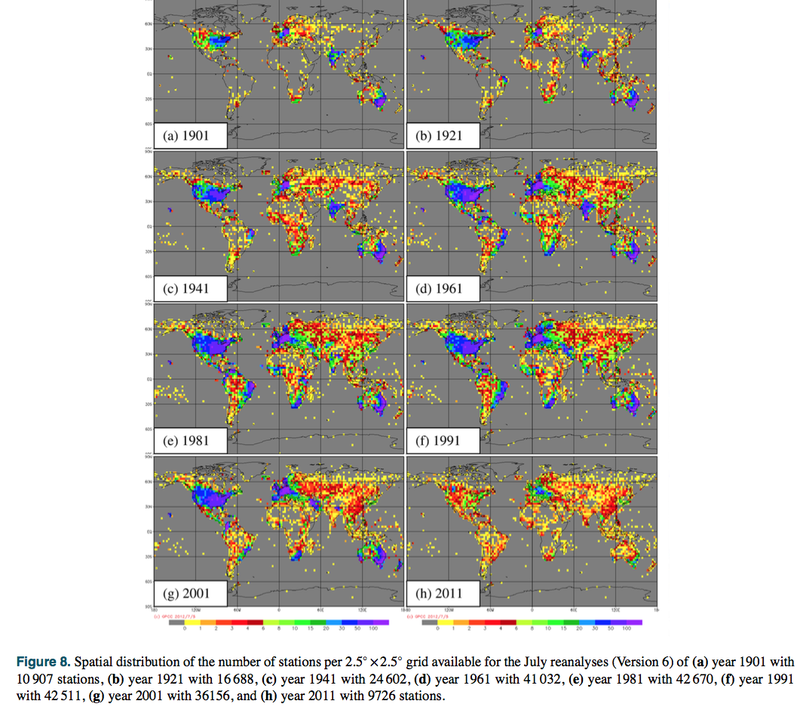 LΔP is about 1W/m² per 1% increase in global precipitation. Now, if we double CO2, then before any temperature changes we decrease the outgoing longwave radiation through the tropopause (the top of the troposphere) by about 3-4W/m² and we increase atmospheric radiation to the surface by about 1W/m². So doubling CO2, ΔRc = -2 to -3W/m²; prior to a temperature change ΔRT = 0; and so ΔP reduces. The authors comment that increasing CO2 before any temperature change takes place reduces the intensity of the hydrological cycle and this effect was seen in early modeling experiments using prescribed sea surface temperatures. Now, of course, the idea of doubling CO2 without any temperature change is just a thought experiment. But it’s an important thought experiment because it lets us isolate different factors. The enhanced radiative cooling due to tropospheric warming, ΔRT, is approximately proportional to ΔT: tropospheric temperatures scale with the surface temperature change and warmer air radiates more energy, so ΔRT = kΔT, with k=3W/(m²K)..
All this is saying is that as the surface warms, the atmosphere warms at about the same rate, and the atmosphere then emits more radiation. This is why the model results of rainfall in our figure 2 above show no trend in rainfall over 50 years, and also match the observations – the constraint on rainfall is the changing radiative balance in the troposphere. Thus, although there is clearly usable information in fig. 3 [our figure 2], it would be physically unjustified to estimate ΔP/ΔT directly from 20th century observations and assume that the same quantity will apply in the future, when the balance between climate drivers will be very different. There is a lot of other interesting commentary in their paper, although the paper itself is now quite dated (and unfortunately behind a paywall). In essence they discuss the difficulties of modeling precipitation changes, especially for a given region, and are looking for “emergent constraints” from more fundamental physics that might help constrain forecasts. A forecasting system that rules out some currently conceivable futures as unlikely could be far more useful for long-range planning than a small number of ultra-high-resolution forecasts that simply rule in some (very detailed futures as possibilities). This is a very important point when considering impacts. Increasing the surface temperature by 1ºC is expected to increase the humidity over the ocean by about 7%. This is simply the basic physics of saturation. However, climate models predict an increase in mean rainfall of maybe 2-3% per ºC. The fundamental reason is that the movement of latent heat from the surface to the atmosphere has to be radiated away by the atmosphere, and so the constraint is the ability of the atmosphere to do this. And so the limiting factor in increasing rainfall is not the humidity increase, it is the radiative cooling of the atmosphere. We also see that despite 50 years of warming, mean rainfall hasn’t changed. Models also predict this. This is believed to be a transient state, for reasons explained in the article. 1 Relative humidity is measured as a percentage. If the relative humidity = 100% it means the air is saturated with water vapor – it can’t hold any more water vapor. If the relative humidity = 0% it means the air is completely dry. As temperature increases the ability of air to hold water vapor increases non-linearly. For example, at 0ºC, 1kg of air can carry around 4g of water vapor, at 10ºC that has doubled to 8g, and at 20ºC it has doubled again to 15g (I’m using approximate values). So now imagine saturated air over the ocean at 20ºC rising up and therefore cooling (it is cooler higher up in the atmosphere). By the time the air parcel has cooled down to 0ºC (this might be anything from 2km to 5km altitude) it is still saturated but is only carrying 4g of water vapor, having condensed out 11g into water droplets. I probably should have started a separate series on rainfall and then woven the results back into the Impacts series. It might take a few articles working through the underlying physics and how models and observations of current and past climate compare before being able to consider impacts. What underlying physics provides definite constraints regardless of individual models, groups of models or parameterizations? 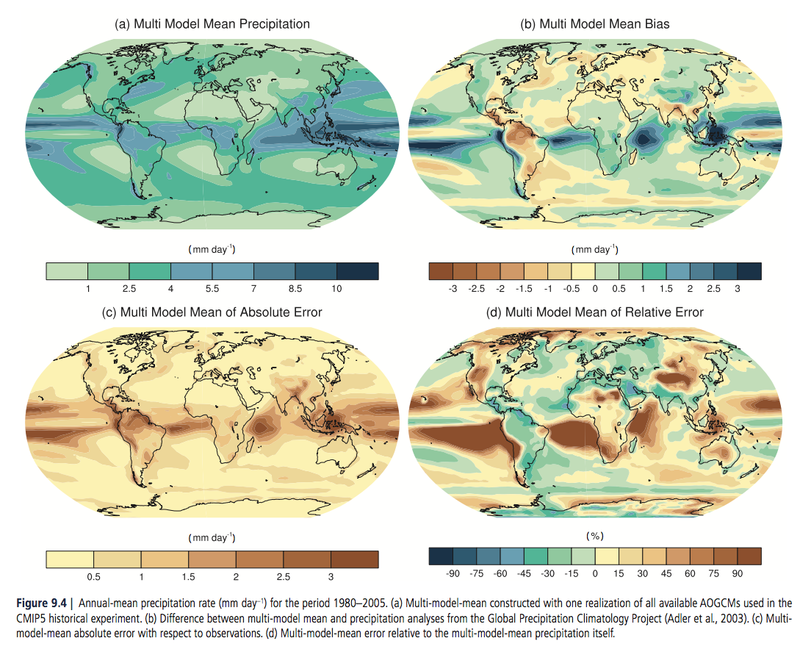 How well do models represent the time series changes of rainfall? How well do models represent the distribution of rainfall and the changing distribution of rainfall, from lightest to heaviest? In this article I thought I would highlight a set of conclusions from one paper among many. It’s a good starting point. 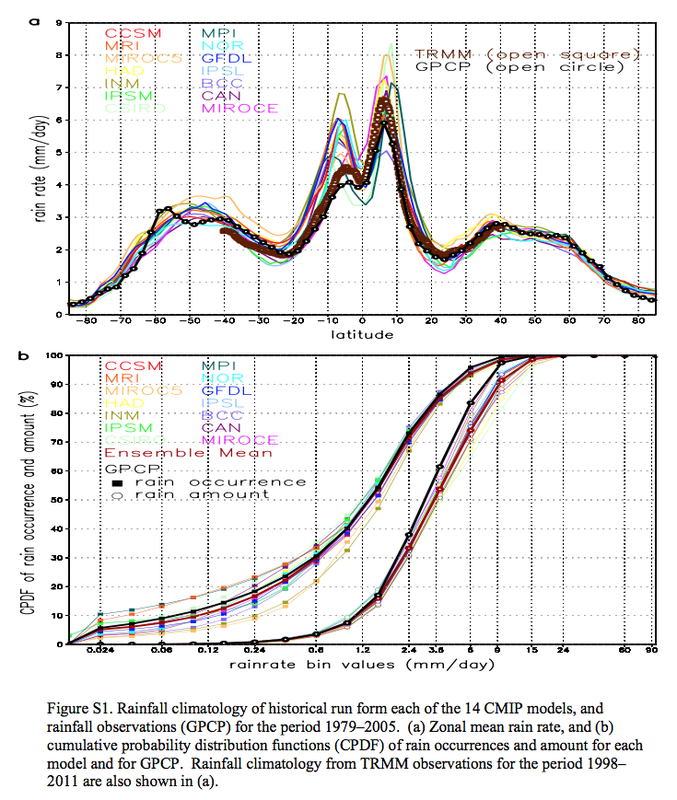 The paper is A canonical response of precipitation characteristics to global warming from CMIP5 models by Lau and his colleagues, and is freely available, and as always I recommend people read the whole paper, along with the supporting information that is also available via the link. As an introduction, the underlying physics perhaps provides some constraints. This is strongly believed in the modeling community. The constraint is a simple one – if we warm the ocean by 1K (= 1ºC) then the amount of water vapor above the ocean surface increases by about 7%. So we expect a warmer world to have more water vapor – at least in the boundary layer (typically 1km) and over the ocean. If we have more water vapor then we expect more rainfall. But GCMs and also simple models suggest a lower value, like 2-3% per K, not 7%/K. We will come back to why in another article. It also seems from models that with global warming, rainfall increases more in regions and times of already high rainfall and reduces in regions and times of low rainfall – the “wet get wetter and the dry get drier”. (Also a marketing mantra that introducing a catchy slogan ensures better progress of an idea). So we also expect changes in the distribution of rainfall. One reason for this is a change in the tropical circulation. 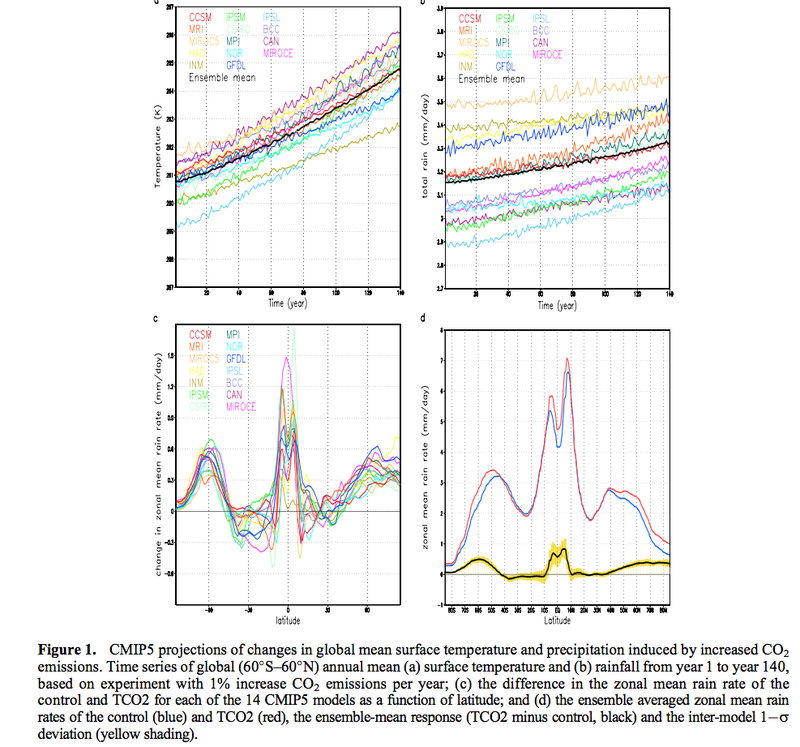 All to be covered later, so onto the paper..
We analyze the outputs of 14 CMIP5 models based on a 140 year experiment with a prescribed 1% per year increase in CO2 emission. This rate of CO2 increase is comparable to that prescribed for the RCP8.5, a relatively conservative business-as-usual scenario, except the latter includes also changes in other GHG and aerosols, besides CO2. A 27-year period at the beginning of the integration is used as the control to compute rainfall and temperature statistics, and to compare with climatology (1979–2005) of rainfall data from the Global Precipitation Climatology Project (GPCP). Two similar 27-year periods in the experiment that correspond approximately to a doubling of CO2 emissions (DCO2) and a tripling of CO2 emissions (TCO2) compared to the control are chosen respectively to compute the same statistics..
Just a note that I disagree with the claim that RCP8.5 is a “relatively conservative business as usual scenario” (see Impacts – II – GHG Emissions Projections: SRES and RCP), but that’s just an opinion, as are all views about where the world will be in population, GDP and cumulative emissions 100-150 years from now. It doesn’t detract from the rainfall analysis in the paper. For people wondering “what is CMIP5?” – this is the model inter-comparison project for the most recent IPCC report (AR5) where many models have to address the same questions so they can be compared. In the figure above, the bottom left graph shows anomalies. We see one of the characteristics of models as a result of more GHGs – wetter tropics and drier sub-tropics, along with wetter conditions at higher latitudes. Lau and his colleagues then look at rainfall distribution in terms of light rainfall through to heavier rainfall. So, take global rainfall and divide it into frequency of occurrence, with light rainfall to the left and heavy rainfall to the right. Take a look back at the bottom graph in the figure above (figure 3, their figure S1). Note that the horizontal axis is logarithmic, with a ratio of over 1000 from left to right. It isn’t an immediately intuitive graph. Basically there are two sets of graphs. 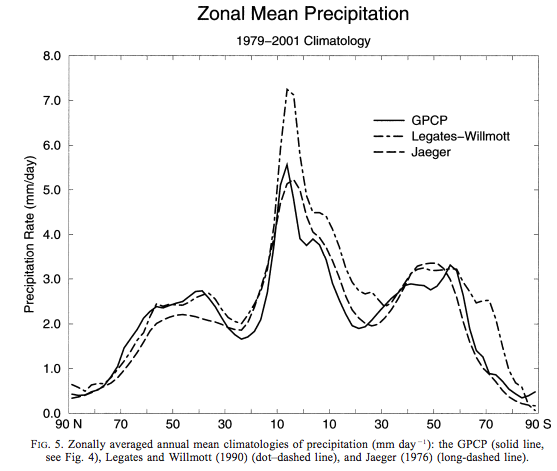 The left “cluster” is how often that rainfall amount occurred, and the black line is GPCP observations. The “right cluster” is how much rainfall fell (as a percentage of total rainfall) for that rainfall amount and again black is observations. So lighter rainfall, like 1mm/day and below accounts for 50% of time, but being light rainfall accounts for less than 10% of total rainfall. 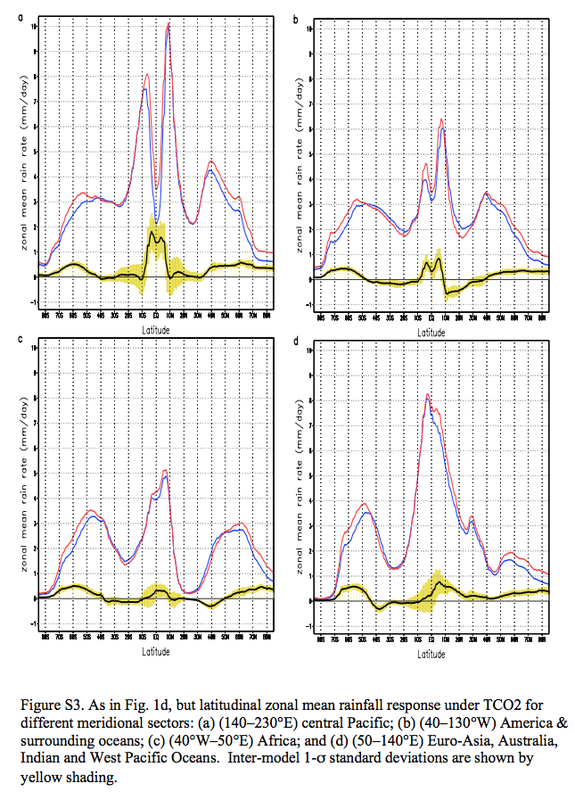 To facilitate discussion regarding rainfall characteristics in this work, we define, based on the ensemble model PDF, three major rain types: light rain (LR), moderate rain (MR), and heavy rain (HR) respectively as those with monthly mean rain rate below the 20th percentile (<0.3 mm/day), between response (TCO2 minus control, black) and the inter-model 1s the 40th–70th percentile (0.9–2.4mm/day), and above the 98.5% percentile (>9mm/day). An extremely heavy rain (EHR) type defined at the 99.9th percentile (>24 mm day1) will also be referred to, as appropriate. We can see that the models tend to overestimate the heavy rain and underestimate the light rain. These graphics are excellent because they help us to see the geographical distribution. Now in the graphs below we see at the top the changes in frequency of mean precipitation (60S-60N) as a function of rain rate; and at the bottom we see the % change in rainfall per K of temperature change, again as a function of rain rate. Note that the bottom graph also has a logarithmic scale for the % change, so as you move up each grid square the value is doubled. Notice that the models are all predicting quite a high % change in rainfall per K for the heaviest rain – something around 50%. 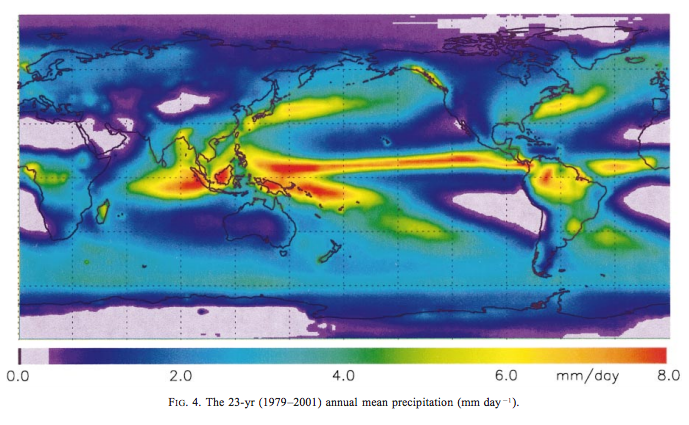 In contrast the light rainfall is expected to be up a few % per K and the medium rainfall is expected to be down a few % per K.
The IPCC CMIP5 models project a robust, canonical global response of rainfall characteristics to CO2 warming, featuring an increase in heavy rain, a reduction in moderate rain, and an increase in light rain occurrence and amount globally. 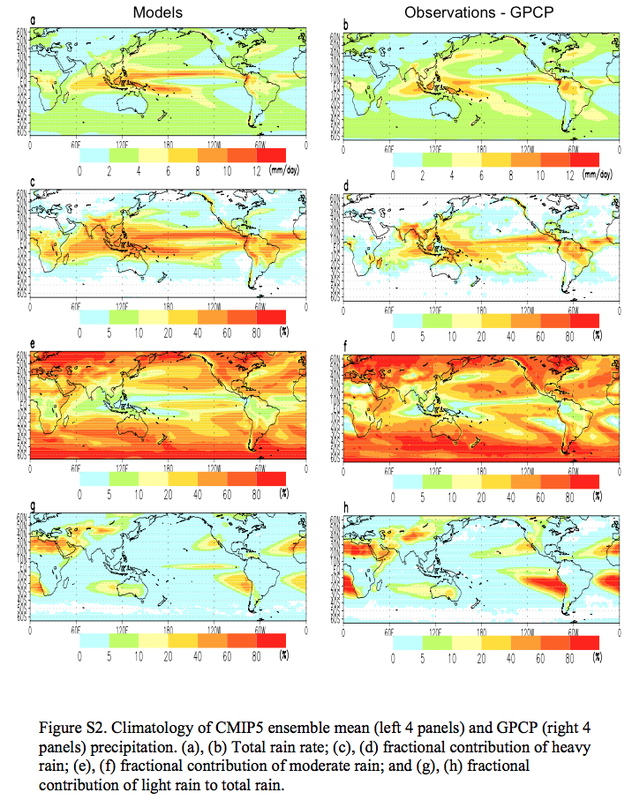 For a scenario of 1% CO2 increase per year, the model ensemble mean projects at the time of approximately tripling of the CO2 emissions, the probability of occurring of extremely heavy rain (monthly mean >24mm/day) will increase globally by 100%–250%, moderate rain will decrease by 5%–10% and light rain will increase by 10%–15%. The increase in heavy rain is most pronounced in the equatorial central Pacific and the Asian monsoon regions. Moderate rain is reduced over extensive oceanic regions in the subtropics and extratropics, but increased over the extratropical land regions of North America, and Eurasia, and extratropical Southern Oceans. Light rain is mostly found to be inversely related to moderate rain locally, and with heavy rain in the central Pacific. The model ensemble also projects a significant global increase up to 16% more frequent in the occurrences of dry months (drought conditions), mostly over the subtropics as well as marginal convective zone in equatorial land regions, reflecting an expansion of the desert and arid zones.. 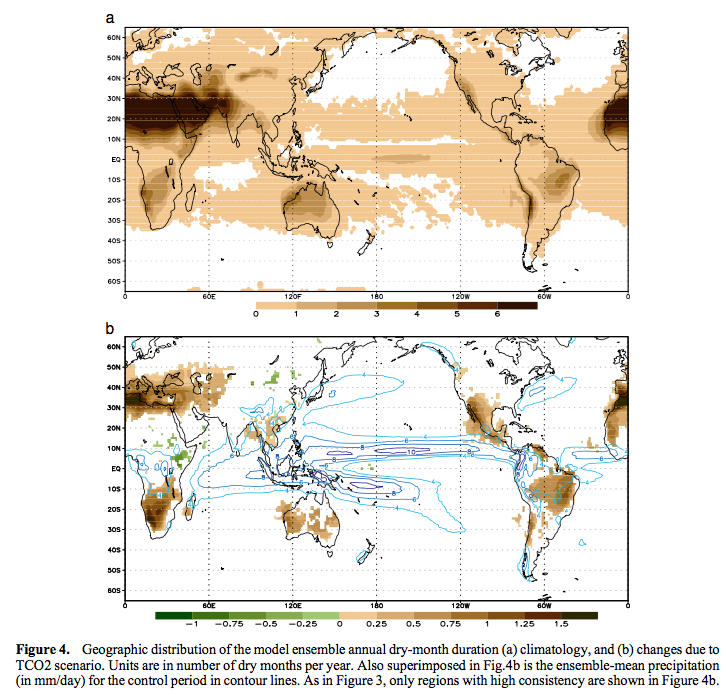 ..Hence, the canonical global rainfall response to CO2 warming captured in the CMIP5 model projection suggests a global scale readjustment involving changes in circulation and rainfall characteristics, including possible teleconnection of extremely heavy rain and droughts separated by far distances. 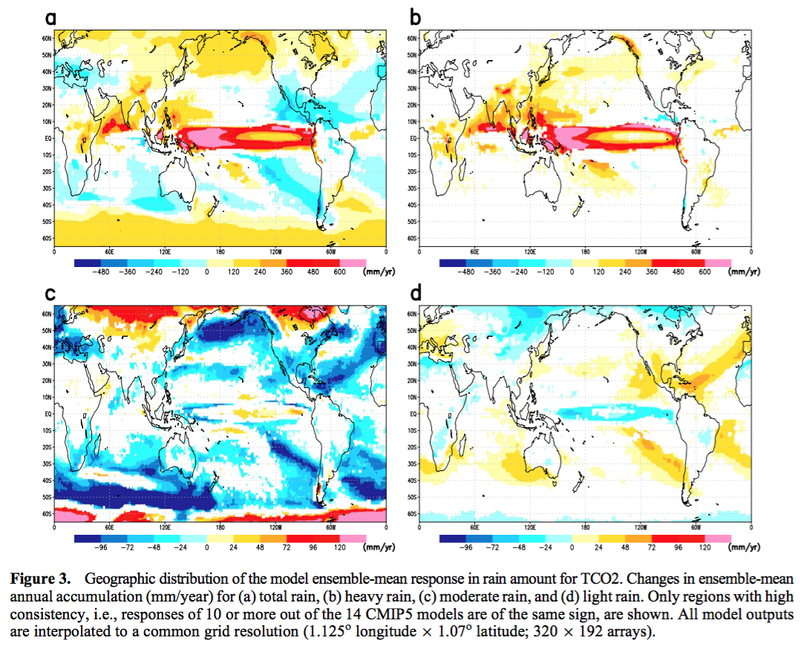 This adjustment is strongly constrained geographically by climatological rainfall pattern, and most likely by the GHG warming induced sea surface temperature anomalies with unstable moister and warmer regions in the deep tropics getting more heavy rain, at the expense of nearby marginal convective zones in the tropics and stable dry zones in the subtropics. Our results are generally consistent with so-called “the rich-getting-richer, poor-getting-poorer” paradigm for precipitation response under global warming.. 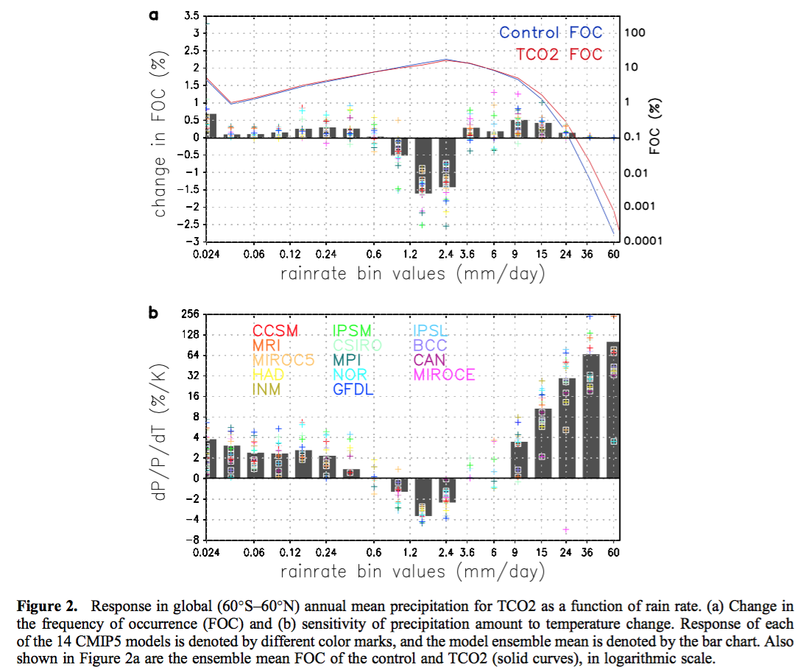 This article has basically presented the results of one paper, which demonstrates consistency in model response of rainfall to doubling and tripling of CO2 in the atmosphere. In subsequent articles we will look at the underlying physics constraints, at time-series over recent decades and try to make some kind of assessment. Here are a bunch of papers that I found useful for readers who want to dig into the subject. Most of them are available for free via Google Scholar, but one of the most helpful to me (first in the list) was Allen & Ingram 2002 and the only way I could access it was to pay $4 to rent it for a couple of days. In one of the iconic climate model tests, CO2 is doubled from a pre-industrial level of 280ppm to 560ppm “overnight” and we find the new steady state surface temperature. The change in CO2 is an input to the climate model, also known as a “forcing” because it is from outside. That is, humans create more CO2 from generating electricity, driving automobiles and other activities – this affects the climate and the climate responds. 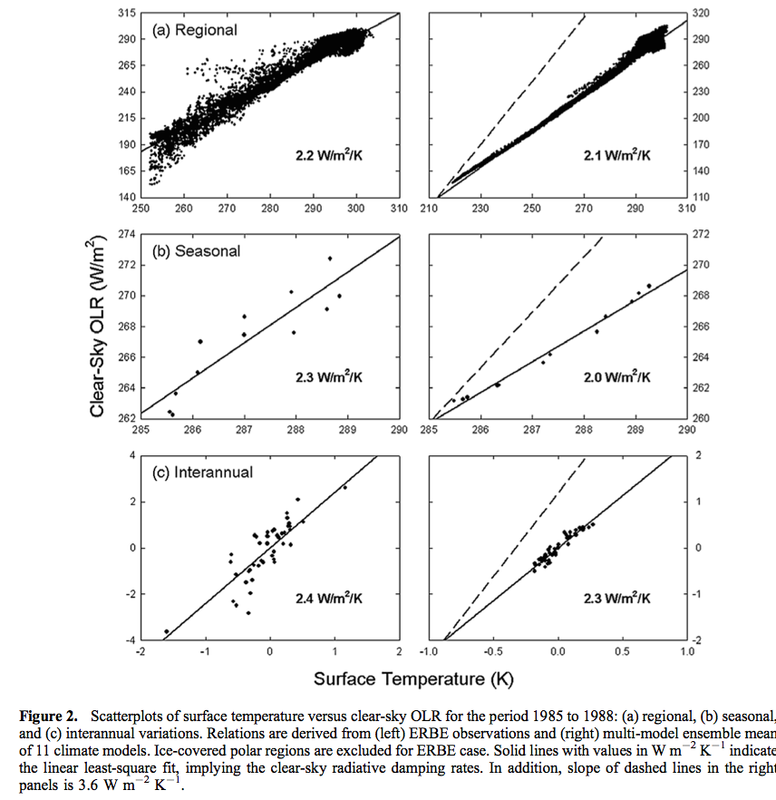 These experiments with simple climate models were first done with 1d radiative-convective models in the 1960s. For example, Manabe & Wetherald 1967 who found a 2.3ºC surface temperature increase with constant relative humidity and 1.3ºC with constant absolute humidity (and for many reasons constant relative humidity seems more likely to be closer to reality than constant absolute humidity). In other experiments, especially more recently, more more complex GCMs simulate 100 years with the CO2 concentration being gradually increased, in line with projections about future emissions – and we see what happens to temperature with time. There are also other GHGs (“greenhouse” gases / radiatively-active gases) in the atmosphere that are changing due to human activity – especially methane (CH4) and nitrous oxide (N2O). And of course, the most important GHG is water vapor, but changes in water vapor concentration are a climate feedback – that is, changes in water vapor result from temperature (and circulation) changes. And there are aerosols, some internally generated within the climate and others emitted by human activity. These also affect the climate in a number of ways. We don’t know what future anthropogenic emissions will be. What will humans do? Build lots more coal-fire power stations to meet energy demand of the future? Run the entire world’s power grid from wind and solar by 2040? Finally invent practical nuclear fusion? How many people will there be? So for this we need some scenarios of future human activity (note 1). In response to a 1994 evaluation of the earlier IPCC IS92 emissions scenarios, the 1996 Plenary of the IPCC requested this Special Report on Emissions Scenarios (SRES) (see Appendix I for the Terms of Reference). This report was accepted by the Working Group III (WGIII) plenary session in March 2000. The long-term nature and uncertainty of climate change and its driving forces require scenarios that extend to the end of the 21st century. This Report describes the new scenarios and how they were developed. The SRES scenarios cover a wide range of the main driving forces of future emissions, from demographic to technological and economic developments. As required by the Terms of Reference, none of the scenarios in the set includes any future policies that explicitly address climate change, although all scenarios necessarily encompass various policies of other types. The set of SRES emissions scenarios is based on an extensive assessment of the literature, six alternative modeling approaches, and an “open process” that solicited wide participation and feedback from many groups and individuals. The SRES scenarios include the range of emissions of all relevant species of greenhouse gases (GHGs) and sulfur and their driving forces..
..By 2100 the world will have changed in ways that are difficult to imagine – as difficult as it would have been at the end of the 19th century to imagine the changes of the 100 years since. Each storyline assumes a distinctly different direction for future developments, such that the four storylines differ in increasingly irreversible ways. Together they describe divergent futures that encompass a significant portion of the underlying uncertainties in the main driving forces. They cover a wide range of key “future” characteristics such as demographic change, economic development, and technological change. For this reason, their plausibility or feasibility should not be considered solely on the basis of an extrapolation of current economic, technological, and social trends. The RCPs were in part a new version of the same idea as SRES and published in 2011. 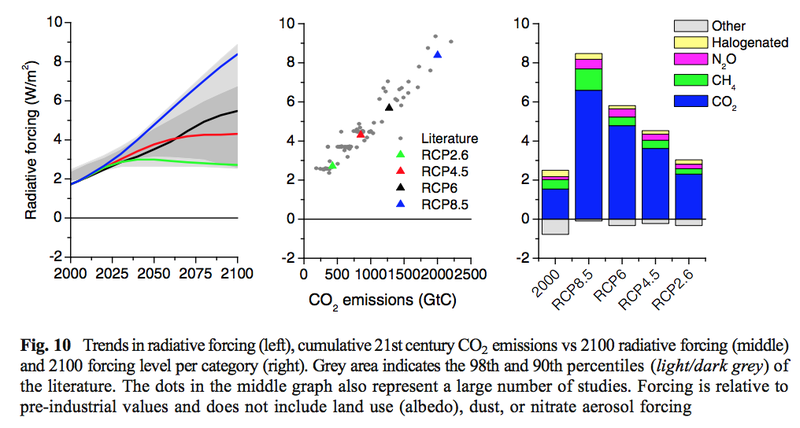 My understanding is that the Representative Concentration Pathways worked more towards final values of radiative forcing in 2100 that were considered in the modeling literature, and you can see this in the names of each RCP. By design, the RCPs, as a set, cover the range of radiative forcing levels examined in the open literature and contain relevant information for climate model runs. This paper summarizes the development process and main characteristics of the Representative Concentration Pathways (RCPs), a set of four new pathways developed for the climate modeling community as a basis for long-term and near-term modeling experiments. 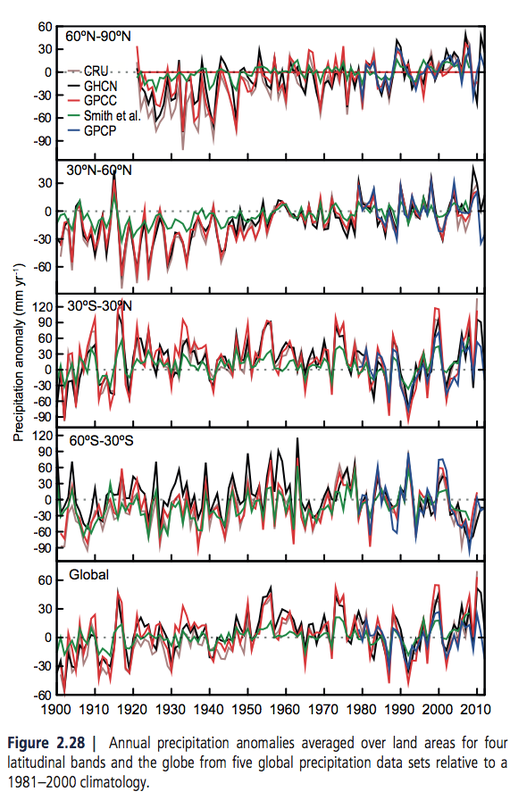 The four RCPs together span the range of year 2100 radiative forcing values found in the open literature, i.e. from 2.6 to 8.5 W/m². The RCPs are the product of an innovative collaboration between integrated assessment modelers, climate modelers, terrestrial ecosystem modelers and emission inventory experts. The resulting product forms a comprehensive data set with high spatial and sectoral resolutions for the period extending to 2100.. ..The RCPs are named according to radiative forcing target level for 2100. The radiative forcing estimates are based on the forcing of greenhouse gases and other forcing agents. 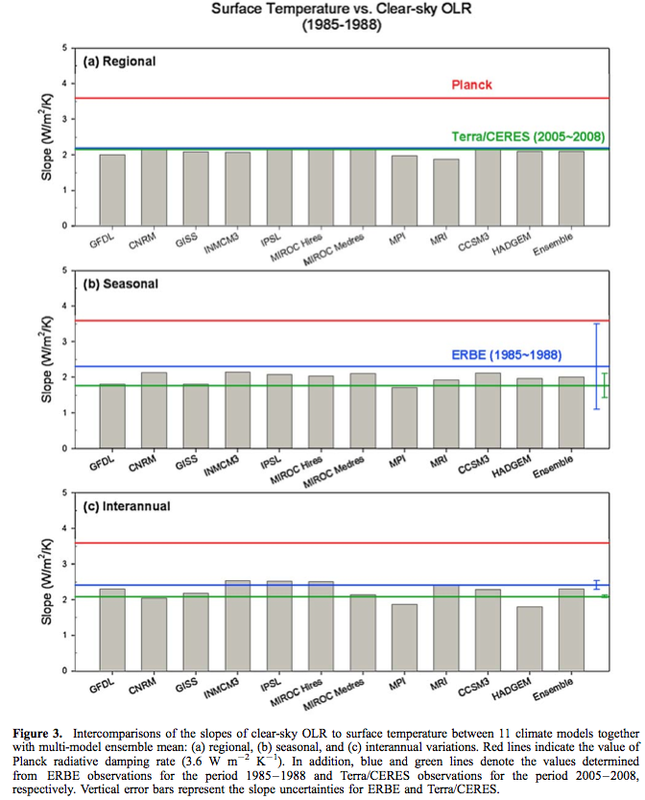 The four selected RCPs were considered to be representative of the literature, and included one mitigation scenario leading to a very low forcing level (RCP2.6), two medium stabilization scenarios (RCP4.5/RCP6) and one very high baseline emission scenarios (RCP8.5). I was surprised by the population graph for RCP 8.5 and 6 (similar scenarios are generated in SRES). From reading various sources (but not diving into any detailed literature) I understood that the consensus was for population to peak mid-century at around 9bn people and then reduce back to something like 7-8bn people by the end of the century. This is because all countries that have experienced rising incomes have significantly reduced average fertility rates. In Africa in 1950, each woman could expect to give birth to 6.6 children; by 2000, that number had fallen to 5.1, and the UN estimates that it is 4.4 today. In Asia as well as in Latin America and the Caribbean, the decline has been even larger, from 6 children to just over 2.. The annual rate of growth of the world’s population, which reached 2.2% in 1960, was only half of that in 2011. The GDP graph on the right (above) is lacking a definition. From the other papers covering the scenarios I understand it to be total world GDP in US$ trillions (at 2000 values, i.e. adjusted for inflation), although the numbers don’t seem to align exactly. We can see from this figure (fig 5, their fig 10) that the RCP numbers refer to the expected radiative forcing in 2100 – so RCP8.5, often known as the “business as usual” scenario has a radiative forcing, compared to pre-industrial values, of 8.5 W/m². And RCP6 has a radiative forcing in 2100, of 6 W/m². We can also see from the figure on the right that increases in CO2 are the cause of almost all of most of the increase from current values. For example, only RCP8.5 has a higher methane (CH4) forcing than today. Business as usual – RCP 8.5 or RCP 6? The scenario’s storyline describes a heterogeneous world with continuously increasing global population, resulting in a global population of 12 billion by 2100. Per capita income growth is slow and both internationally as well as regionally there is only little convergence between high and low income countries. Global GDP reaches around 250 trillion US2005$ in 2100. The slow economic development also implies little progress in terms of efficiency. Combined with the high population growth, this leads to high energy demands. Still, international trade in energy and technology is limited and overall rates of technological progress is modest. The inherent emphasis on greater self-sufficiency of individual countries and regions assumed in the scenario implies a reliance on domestically available resources. Resource availability is not necessarily a constraint but easily accessible conventional oil and gas become relatively scarce in comparison to more difficult to harvest unconventional fuels like tar sands or oil shale. Given the overall slow rate of technological improvements in low-carbon technologies, the future energy system moves toward coal-intensive technology choices with high GHG emissions. Environmental concerns in the A2 world are locally strong, especially in high and medium income regions. Food security is also a major concern, especially in low-income regions and agricultural productivity increases to feed a steadily increasing population. Compared to the broader integrated assessment literature, the RCP8.5 represents thus a scenario with high global population and intermediate development in terms of total GDP (Fig. 4). Per capita income, however, stays at comparatively low levels of about 20,000 US $2005 in the long term (2100), which is considerably below the median of the scenario literature. 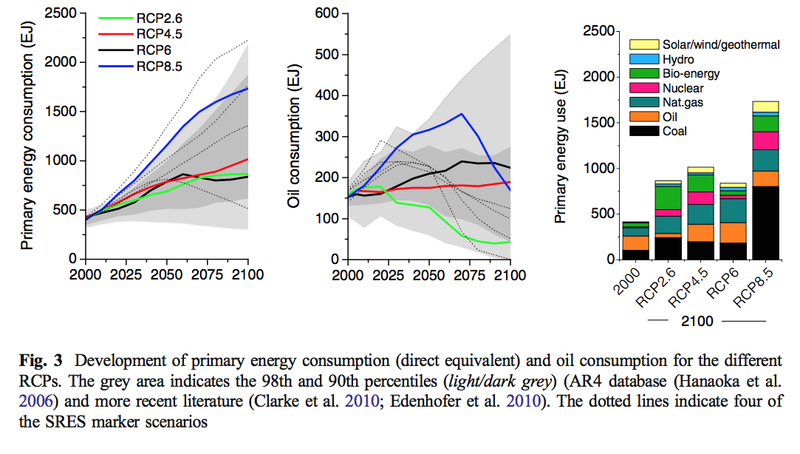 Another important characteristic of the RCP8.5 scenario is its relatively slow improvement in primary energy intensity of 0.5% per year over the course of the century. This trend reflects the storyline assumption of slow technological change. Energy intensity improvement rates are thus well below historical average (about 1% per year between 1940 and 2000). Compared to the scenario literature RCP8.5 depicts thus a relatively conservative business as usual case with low income, high population and high energy demand due to only modest improvements in energy intensity. When I heard the term “business as usual” I’m sure I wasn’t alone in understanding it like this: the world carries on without adopting serious CO2 limiting policies. That is, no international agreements on CO2 reductions, no carbon pricing, etc. And the world continues on its current trajectory of growth and development. When you look at the last 40 years, it has been quite amazing. Why would growth slow, population not follow the pathway it has followed in all countries that have seen rising prosperity, and why would technological innovation and adoption slow? It would be interesting to see a “business as usual” scenario for emissions, CO2 concentrations and radiative forcing that had a better fit to the name. RCP 6 seems to be a closer fit than RCP 8.5 to the name “business as usual”. 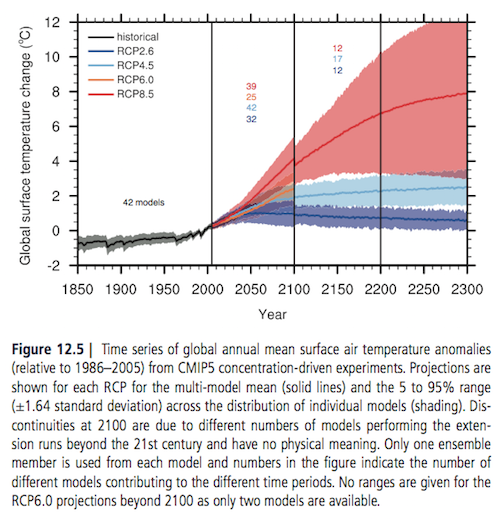 RCP6 is a climate-policy intervention scenario. That is, without explicit policies designed to reduce emissions, radiative forcing would exceed 6.0 W/m² in the year 2100. However, the degree of GHG emissions mitigation required over the period 2010 to 2060 is small, particularly compared to RCP4.5 and RCP2.6, but also compared to emissions mitigation requirement subsequent to 2060 in RCP6 (Van Vuuren et al., 2011). 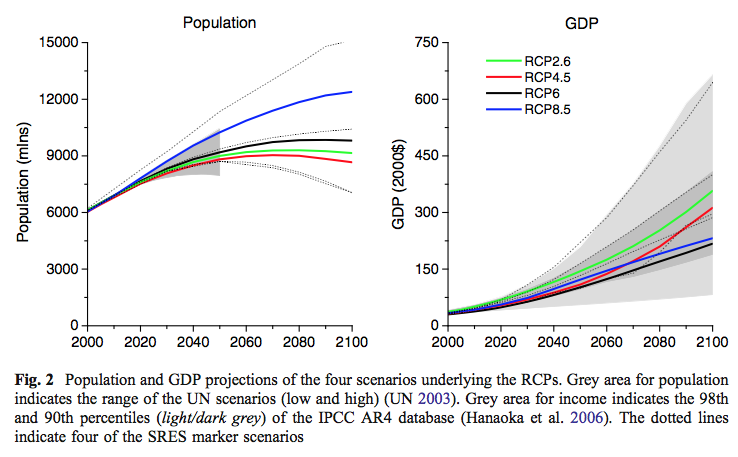 The IPCC Fourth Assessment Report classified stabilization scenarios into six categories as shown in Table 1. RCP6 scenario falls into the border between the fifth category and the sixth category. 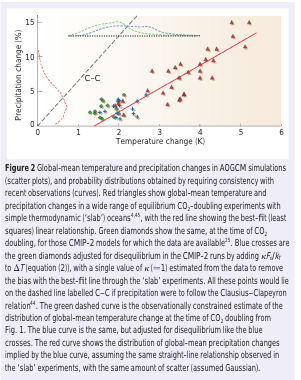 Its global mean long-term, steady-state equilibrium temperature could be expected to rise 4.9° centigrade, assuming a climate sensitivity of 3.0 and its CO2 equivalent concentration could be 855 ppm (Metz et al. 2007). The Etiquette and About this Blog both explain the commenting policy in this blog. I noted briefly in the Introduction that of course questions about 100 years from now mean some small relaxation of the policy. But, in a large number of previous articles, we have discussed the “greenhouse” effect (just about to death) and so people who question it are welcome to find a relevant article and comment there – for example, The “Greenhouse” Effect Explained in Simple Terms which has many links to related articles. Questions on climate sensitivity, natural variation, and likelihood of projected future temperatures due to emissions are, of course, all still fair game in this series. But I’ll just delete comments that question the existence of the greenhouse effect. Draconian, no doubt. Note 1: Even if we knew future anthropogenic emissions accurately it wouldn’t give us the whole picture. The climate has sources and sinks for CO2 and methane and there is some uncertainty about them, especially how well they will operate in the future. That is, anthropogenic emissions are modified by the feedback of sources and sinks for these emissions. The subject of EMICs – Earth Models of Intermediate Complexity – came up in recent comments on Ghosts of Climates Past – Eleven – End of the Last Ice age. I promised to write something about EMICs, in part because of my memory of a more recent paper on EMICs. This article will just be short as I found that I have already covered some of the EMIC ground. The usual approach using GCMs is to have some combination of lower resolution grids, “faster” time and prescribed ice sheets and greenhouse gases. What the paper [Jochum et al, 2012] also reveals – in conjunction with what we have seen from earlier articles – is that as we move through generations and complexities of models we can get success, then a better model produces failure, then a better model again produces success. Also we noted that whereas the 2003 model (also cold-biased) of Vettoretti & Peltier found perennial snow cover through increased moisture transport into the critical region (which they describe as an “atmospheric–cryospheric feedback mechanism”), this more recent study with a better model found no increase in moisture transport. So, onto a little more about EMICs. There are two papers from 2000/2001 describing the CLIMBER-2 model and the results from sensitivity experiments. These are by the same set of authors – Petoukhov et al 2000 & Ganopolski et al 2001 (see references). The CLIMBER-2 model has a low spatial resolution which only resolves individual continents (subcontinents) and ocean basins (fig 1). Latitudinal resolutions is the same for all modules (10º). In the longitudinal direction the Earth is represented by seven equal sectors (roughly 51º􏰖 longitude) in the atmosphere and land modules. The ocean model is a zonally averaged multibasin model, which in longitudinal direction resolves only three ocean basins Atlantic, Indian, Pacific). Each ocean grid cell communicates with either one, two or three atmosphere grid cells, depending on the width of the ocean basin. Very schematic orography and bathymetry are prescribed in the model, to represent the Tibetan plateau, the high Antarctic elevation and the presence of the Greenland-Scotland sill in the Atlantic ocean. The atmospheric model has a simplified approach, leading to the description 2.5D model. The time step can be relaxed to about 1 day per step. The ocean grid is a little finer in latitude. 1. Parameters which are known empirically or from theory must not be used for tuning. 2. Where ever possible parametrizations should be tuned separately against observed data, not in the context of the whole model. (Most of the parameters values in Table 1 were obtained in this way and only few of them were determined by tuning the model to the observed climate). 3. Parameters must relate to physical processes, not to specific geographic regions (hidden flux adjustments). 4. The number of tuning parameters must be much smaller than the degrees of freedom predicted by the model. (In our case the predicted degrees of freedom exceed the number of tuning parameters by several orders of magnitude). To apply the coupled climate model for simulations of climates substantially different from the present, it is crucial to avoid any type of ̄flux adjustment. One of the reasons for the need of ̄flux adjustments in many general circulation models is their high computational cost, which makes optimal tuning􏱃 difficult. The high speed of CLIMBER-2 allows us to perform many sensitivity experiments required to identify the physical reasons for model problems and the best parameter choices. A physically correct choice of model parameters is fundamentally different from a flux adjustment; only in the former case the surface fluxes are part of the proper feedbacks when the climate changes. So this all sounds reasonable. Obviously it is a model with less resolution than a GCM, and even the high resolution (by current standards) GCMs need some kind of approach to parameter selection (see Models, On – and Off – the Catwalk – Part Four – Tuning & the Magic Behind the Scenes). We will start the discussion of modelling results with a so-called Baseline Experiment (BE). This experiment represents a “suboptimal” subjective tuning of the model parameters to achieve the best agreement between modelling results and palaeoclimate data. Obviously, even with a model of intermediate complexity it is not possible to test all possible combinations of important model parameters which can be considered as free (tunable) parameters. In fact, the BE was selected from hundred model simulations of the last glacial cycle with different combinations of key model parameters. Note, that we consider “tunable” parameters only for the ice-sheet model and the SEMI interface, while the utilized climate component of CLIMBER-2 is the same in previous studies, such as those used by C05 [this is Calov et al. (2005)]. In the next section, we will discuss the results of a set of sensitivity experiments, which show that our modelling results are rather sensitive to the choice of the model parameters.. ..The ice sheet model and the ice sheet-climate interface contain a number of parameters which are not derived from first principles. They can be considered as “tunable” parameters. As stated above, the BE was subjectively selected from a large suite of experiments as the best fit to empirical data. Below we will discuss results of a number of additional experiments illustrating the sensitivity of simulated glacial cycle to several model parameters. These results show that the model is rather sensitive to a number of poorly constrained parameters and parameterisations, demonstrating the challenges to realistic simulations of glacial cycles with a comprehensive Earth system model. Our experiments demonstrate that the CLIMBER-2 model with an appropriate choice of model parameters simulates the major aspects of the last glacial cycle under orbital and greenhouse gases forcing rather realistically. In the simulations, the glacial cycle begins with a relatively abrupt lateral expansion of the North American ice sheets and parallel growth of the smaller northern European ice sheets. During the initial phase of the glacial cycle (MIS 5), the ice sheets experience large variations on precessional time scales. Later on, due to a decrease in the magnitude of the precessional cycle and a stabilising effect of low CO2 concentration, the ice sheets remain large and grow consistently before reaching their maximum at around 20 kyr BP..
..From about 19 kyr BP, the ice sheets start to retreat with a maximum rate of sea level rise reaching some 15 m per 1000 years around 15kyrBP. The northern European ice sheets disappeared first, and the North American ice sheets completely disappeared at around 7 kyr BP. Fast sliding processes and the reduction of surface albedo due to deposition of dust play an important role in rapid deglaciation of the NH. Thus our results strongly support the idea about important role of aeolian dust in the termination of glacial cycles proposed earlier by Peltier and Marshall (1995).. ..Results from a set of sensitivity experiments demonstrate high sensitivity of simulated glacial cycle to the choice of some modelling parameters, and thus indicate the challenge to perform realistic simulations of glacial cycles with the computationally expensive models. My summary – the simplifications of the EMIC combined with the “trying lots of parameters” approach means I have trouble putting much significance on the results. While the basic setup, as described in the 2000 & 2001 papers seems reasonable, EMICs miss a lot of physics. This is important with something like starting and ending an ice age, where the feedbacks in higher resolution models can significantly reduce the effect seen by lower resolution models. When we run 100’s of simulations with different parameters (relating to the ice sheet) and find the best result I wonder what we’ve actually found. That doesn’t mean they are of no value. Models help us to understand how the physics of climate actually works, because we can’t do these calculations in our heads. GCMs require too much computing resources to properly study ice ages. I don’t see them as demonstrating that the results “show” we’ve now modeled ice ages. The exact same comment also goes for another 2007 paper which used a GCM coupled to an ice sheet model that we covered in Part Nineteen – Ice Sheet Models I. An update of that paper in 2013 came with a excited Nature press release but to me simply demonstrates that with a few unknown parameters you can get a good result with some specific values of those parameters. This is not at all surprising. Let’s call it a good start. Perhaps Abe Ouchi et al 2013 was the paper that will be verified as the answer to the question of ice age terminations – the delayed isostatic rebound. Perhaps Ganopolski, Calov & Claussen 2010 with the interaction of dust on ice sheets will be verified as the answer to that question.